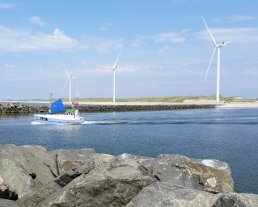 Denmark’s geographically largest municipality, Ringkøbing-Skjern, is well on the way to becoming 100% self-sufficient with renewable energy by 2020. By utilizing the area’s vast wealth of natural resources, the municipality has already managed to increase its renewable energy supply from approximately 20% in 2007 to 58% in 2015. In particular, wind energy production has increased by 479%, from 888 to 4,257 TJ/year. In Denmark, Ringkøbing-Skjern is thus the municipality producing the most electricity (in absolute terms) from onshore wind turbines. The large amount of wind energy creates benefits for not only locals but the entire country, as much of it is exported to the rest of Denmark. The energy plan, Energi2020, is developed in close collaboration between the City Council, the Energy Council, the Energy Secretariat and a number of voluntary and professional energy groups. Based on recommendations, meetings and workshops with citizens, the City Council has defined and decided specific areas of actions and priorities. These efforts do not only involve the municipality legislation and administration, but also citizens, companies and institutions. This partnership approach increases local ownership of the many energy projects in terms of development, investment and production. At the national level, Ringkøbing-Skjern is at the top when it comes to the amount of energy generated from wind turbines. The project increases the production of sustainable energy, especially wind and solar, resulting in a CO2 emissions reduction from 11.1 to 2.8 tonnes per year per capita between 2007-15. The project creates jobs and boosts employment growth: 4,137 people now work in the energy and climate sector. In addition, Ringkøbing-Skjern has the lowest unemployment rate, at just 2.4%. As part of Energi2020, more than 400 homes underwent energy audits, leading to significant energy savings in the municipality. A further 1,000 energy audits have already been scheduled.